Do you all hear a huge sigh coming from Bloom? I just finished my styling, designing and baking for my 4th party in 7 weeks. The last one was on Friday and it was really one of my favorites. It was a great way to end the amazing run of parties. I had a blast doing all of these and was so honored to participate but it definitely was a busy, busy few months. I can't wait to share these parties with you very soon, but now, I am so excited to focus on the holidays. I am MOST thankful for my children so I wanted to create a few thanksgiving favors just for them. 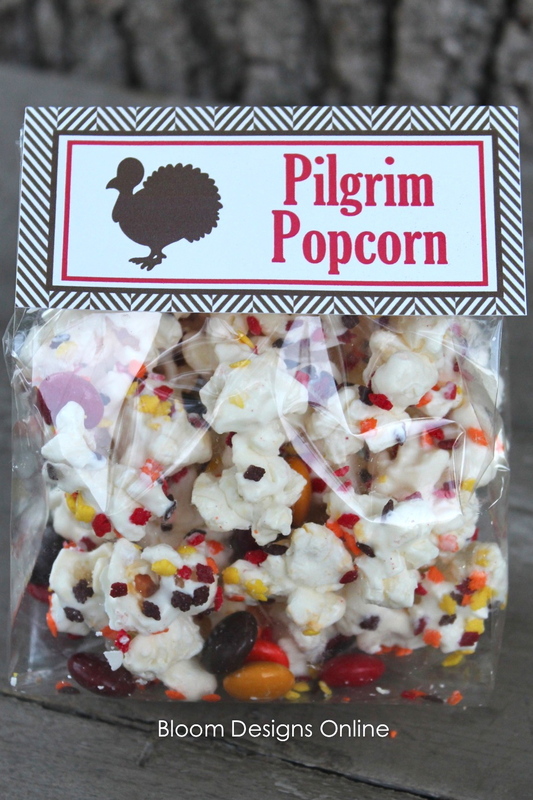 The gobble gum, turkey toes and pilgrim popcorn will definitely make them feel special this Thanksgiving. Fill clear plastic tubes found here with gum balls or candy corns, add the cute tag and your done. 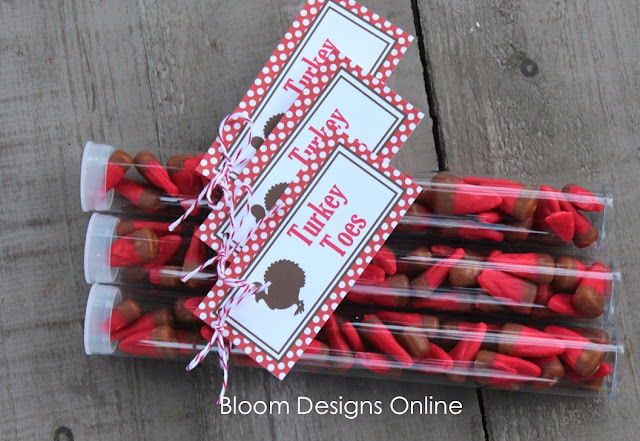 Put one by place setting at your dinner table or pass out as favors when your guest leave. Quick and easy! 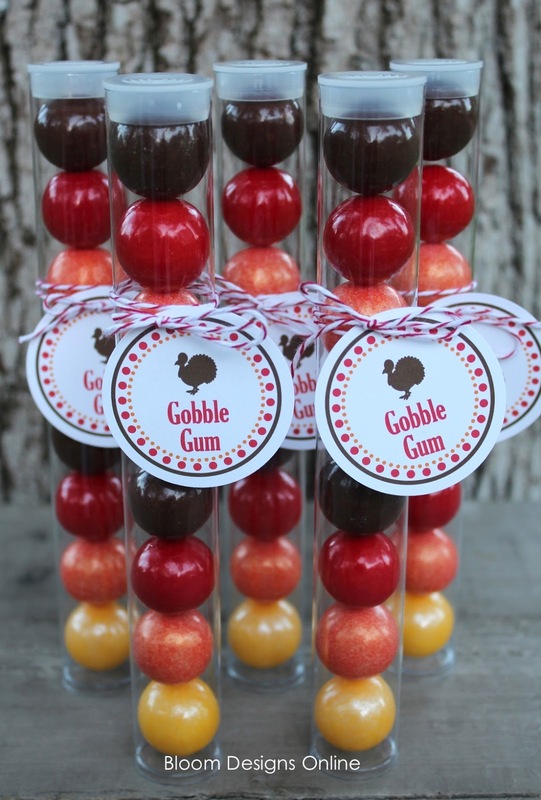 Even easier- Fully assembled, ready to go Turkey Toes and Gobble Gum Ball Tubes are available for purchase here. 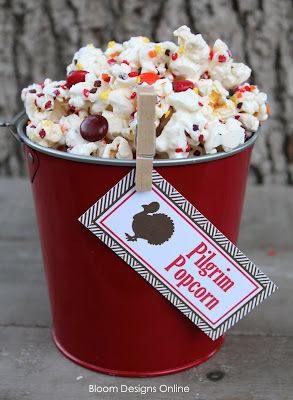 Use the basic party popcorn recipe found here but add in leaf confetti and harvest M&M's. Holy Cow- I can't believe Thanksgiving is just 2 weeks from Thursday! I Would love the tags. Tbowling2001@gmail.com. I love your blog. I love these! Very cute idea to send to my missionary. I just ordered the tubes from you. Now would love the tags. Thanks! So creative & festive! 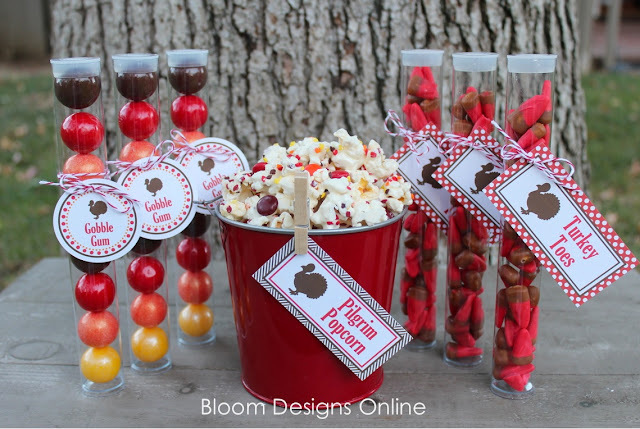 These would be great for my kiddos & co-workers at school. I plan on ordering the tubes and would love the tags as well (gill.michaela@gmail.com) Thank you! Would love the download to the tags. Too darn cute. Please send me this file: adidasdiva01@yahoo.com. These are too cute! 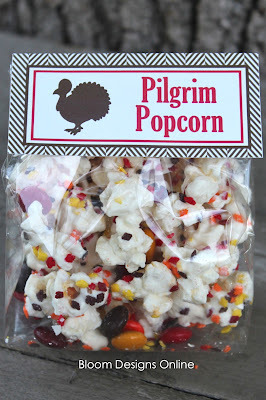 Also, thanks for sending the Halloween treat tags; they were a HUGE hit with my daughter's classmates and her teacher! I would love to have the tags download! Thank you! Oh how clever is this!! LOVE it.! Thank you. Love these tags! Thanks for sharing! Great ideals for my students. Please send tags. As Always...Cute tags. Please send to bobbi19901@yahoo.com. 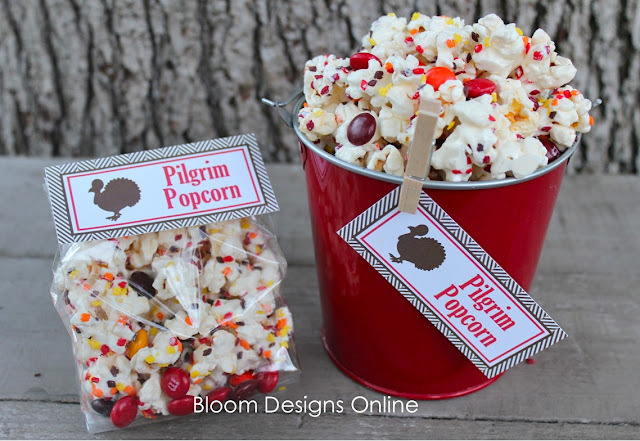 I wanted to Thank-you for sending the Halloween Tags- they were a big hit in my granddaughters classroom. Also, a quick question- Do you combine shipping for items purchased in your ESTY store? Please send me the tags. Love this! Please send me the tags....blhcheerwv@aol.com. I have been following you for months and when I commenting never get the tag. Do I need to buy something first? so super cute!! what a great idea..mandaconder@hotmail.com...thank you!! Hi Jenny! These are too cute. I would love a copy. These are lovely! perfect for teachers and friends. I just became a follower by email!! I would be so thankful if you would email me the printable tags. My email is stefaniefarmer@crossoverdrives.com. Thank you!!! Also, I requested the Turkey treats as well and I have not received them yet. Will it be possible to get them by Wednesday so I can give these to my daughters teachers before school breaks for Thanksgiving on Friday? Thanks so much! 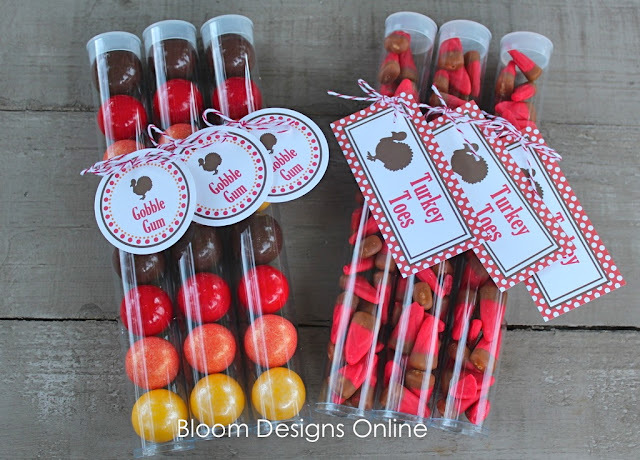 What a great twist on favours for Thanksgiving! I wish people in Australia celebrated it (apart from my friends and I) - Halloween has made it's way here - and that's one I could so do without! I follow you by RSS, how do I print the free tags? Hi! I'm afraid I might have missed the link to the Thanksgiving printables - I sure hope not. Your creations are sooo special! Please email them to; jjardes@olatheks.org. I want to say a HUGE thank you for going above and beyond to make sure I was taken care of. Have a great Thanksgiving!!!! And THANK YOU for sharing! I have started following you on pinterest and love your pins. I would live these tags pleaded. My email is tammyleek@hotmail.com.Thanks!